When it was first release, this shoe has been in the spotlight and the much-improved Air Jordan 8.0 is expected to be on the spotlight once again after it was recently released in a new colorway. The much-lover and much-sleeker edition of the Air Jordan 8.0 is now available in White/Varsity Red-Neutral Grey-Flint Grey colorway. 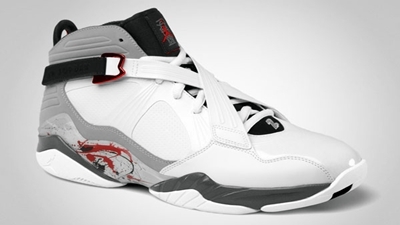 The silhouette is made with white upper part enhanced with varsity red and grey accents throughout the sneaker. Aside from the top-class qualities it provides, this new Air Jordan 8.0 is also an eye-candy, making it a must buy this month!